You can read the official website for a precise definition - but for me it's a super clever data binding and structuring tool. 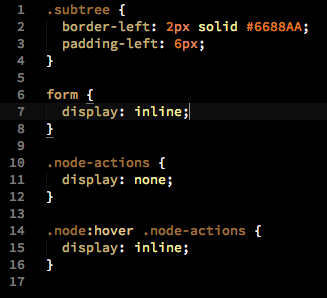 The binding engine can sync the data between UI and JS variables. The structuring layer can help you to build up your complex ui. I've got a question the other day: What would you use AngularJS for? Now I'm kinda sure about it: it's for webapps where you need mostly a data-reflective dynamic UI where reaction time matters. There are great videos and tutorials online, I'm not gonna cover any of them. Instead I explain my problem I wanted to solve with the library. I wanted to make a mindmap - where you can add nodes, edit them - and at the end you just got an exportable format (JSON or Freemind XML). For the map I needed recursive rendering to represent the hierarchy of the tree. So I've checked the reference. Among many useful (but less relevant features) I've found ngInclude. My only problem I didn't find any way to transfer variables. On the ui you can easily create iterations but couldn't crack my head through the ngController and other parts. 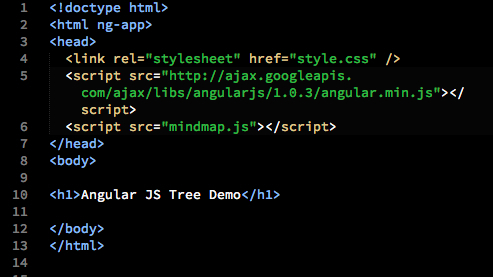 You can see we load the minimized AngularJS library from Google CDN, our custom script and the stylesheet. 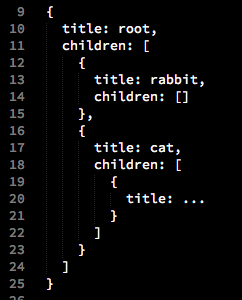 The only strange thing is ng-app in the HTML tag. That tells AngularJS to process the tagged DOM part - here the whole document. You can see 2 things here. ng-controller="MindMap" and ng-include. ng-controller defines the controller class for that particular DOM subtree. I'll talk about ng-include soon. It makes sure that the form is only visible when we're on the node. There are couple of things I've not yet managed to solve. I can create a delete button next to each element - but somehow it's tricky to find the right element to delete, even if I have the proper subtree object. I couldn't refer back to the input field and delete it's value. Mapping didn't worked that way or I missed something, I don't know yet. If you could help me out with some tips I'd really appreciate it. Thank Peter for this helpful article.